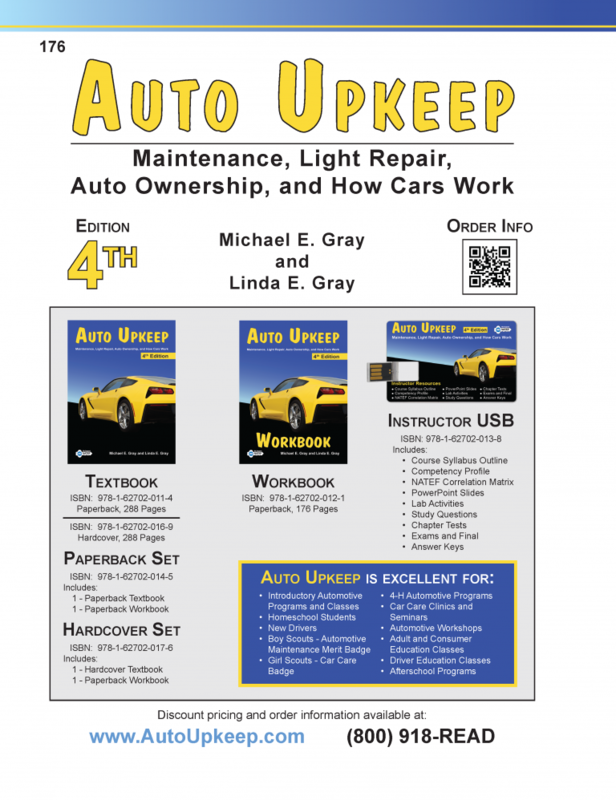 The Auto Upkeep Workbook was created to work as an extension of the Auto Upkeep Textbook (see related products). The workbook contains 40 Internet-based and hands-on activities that are extensions of each chapter of the textbook. 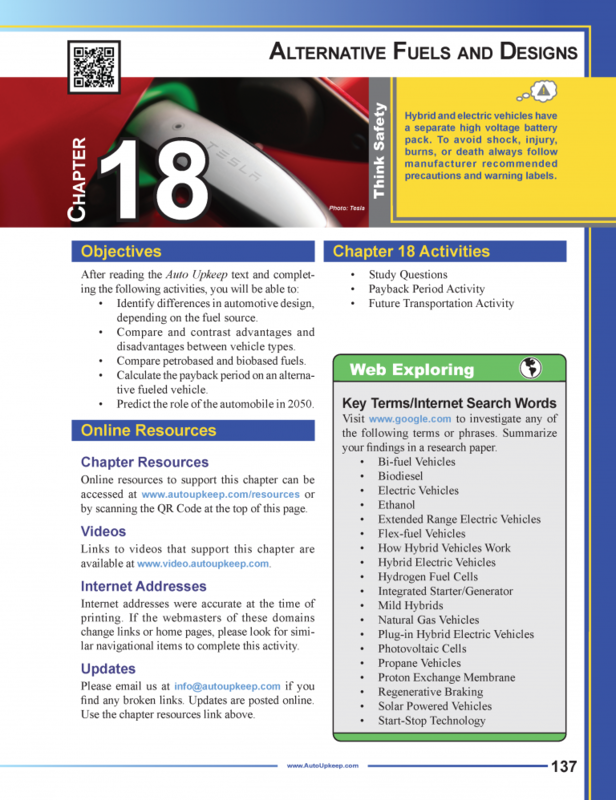 The workbook chapters each include objectives, online resources, key search words, up to five Internet-based or hands-on activities, study questions, and journal questions. 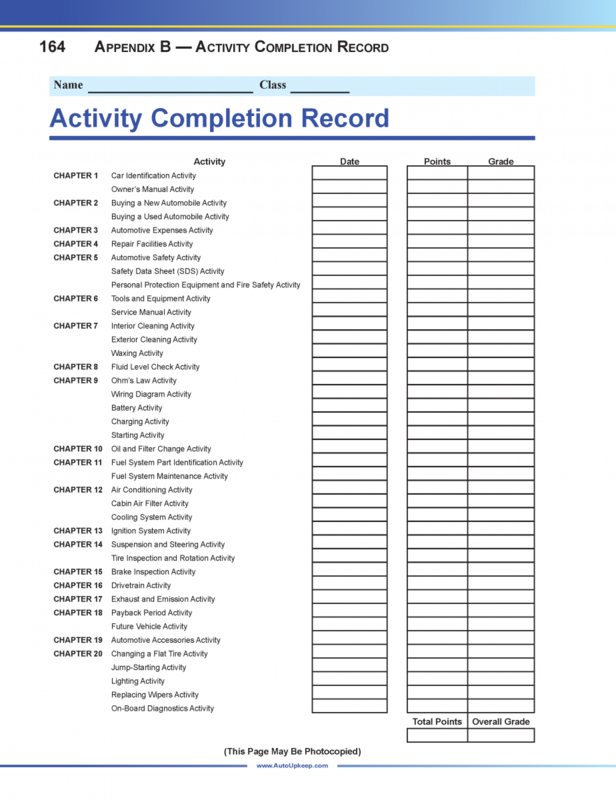 The activities list necessary tools, supplies, and step-by-step instructions with illustrations. 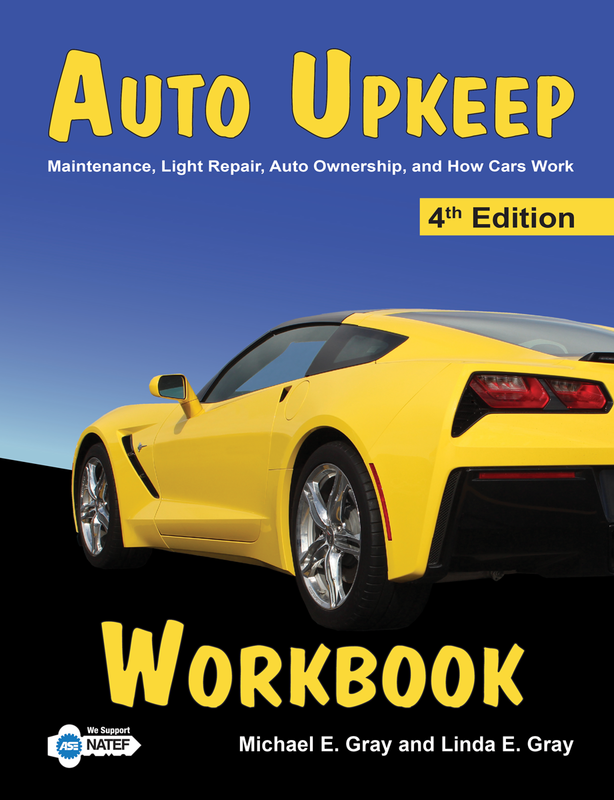 By completing the Auto Upkeep Textbook and Workbook you will learn how to choose a quality repair facility, buy a car, handle roadside emergencies, diagnose common problems, and communicate effectively with technicians – all while saving money. 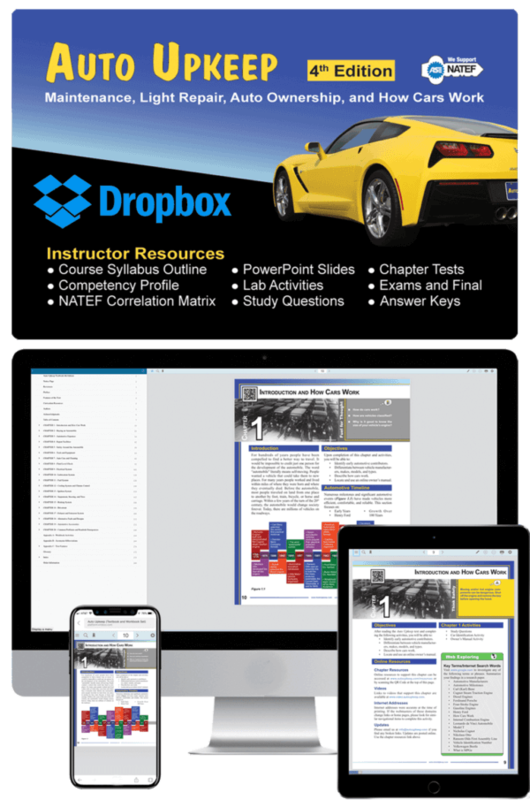 Car Identification Activity – Identify an automobile by make, model, year, and type. 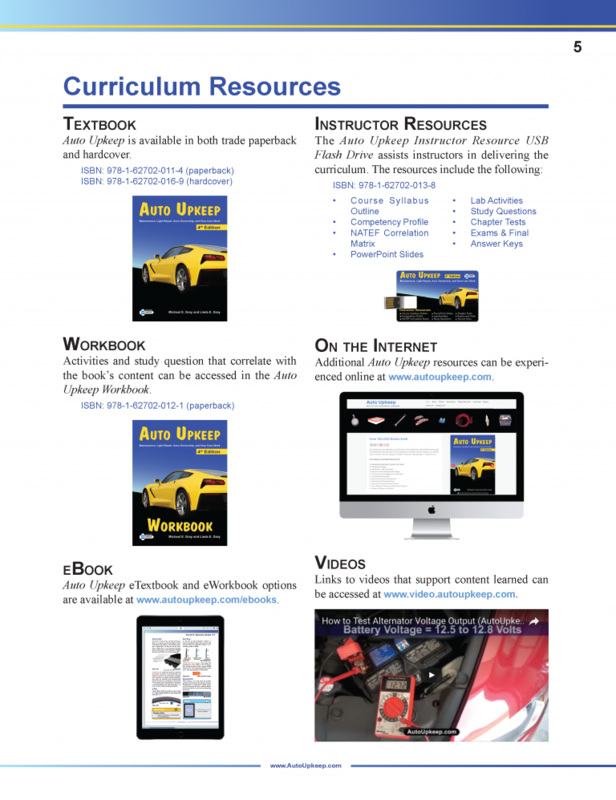 Owners Manual Activity – Locate and use an online owners manual. 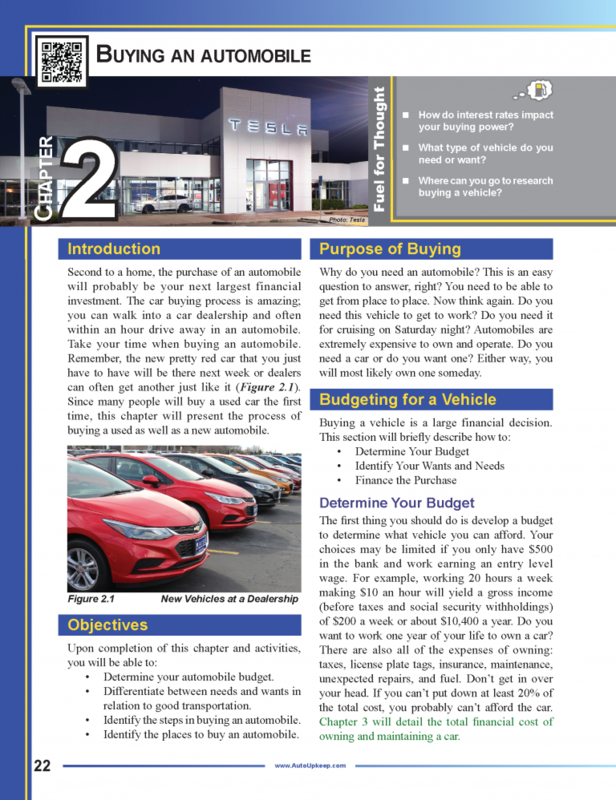 Buying a New Automobile Activity – Differentiate between MSRP, dealer invoice, and dealer cost. 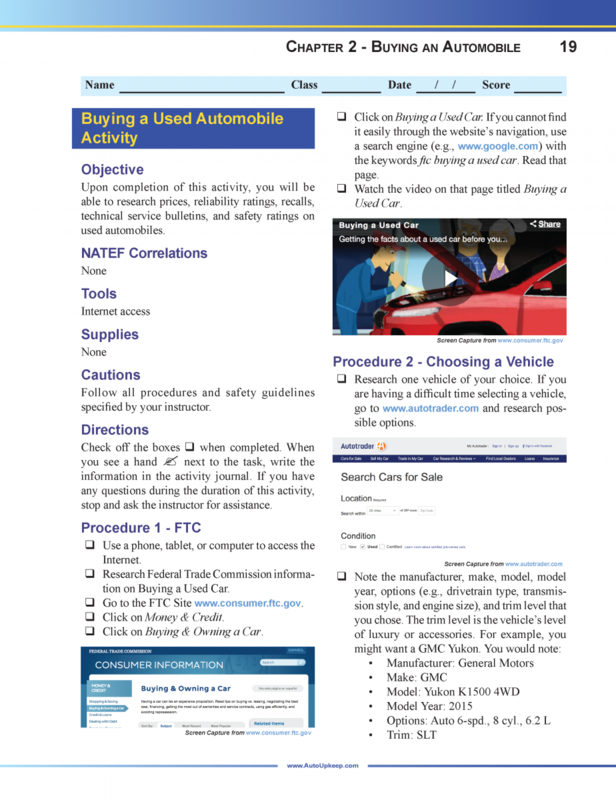 Buying a Used Automobile Activity – Research prices, reliability ratings, recalls, technical service bulletins, and safety ratings. 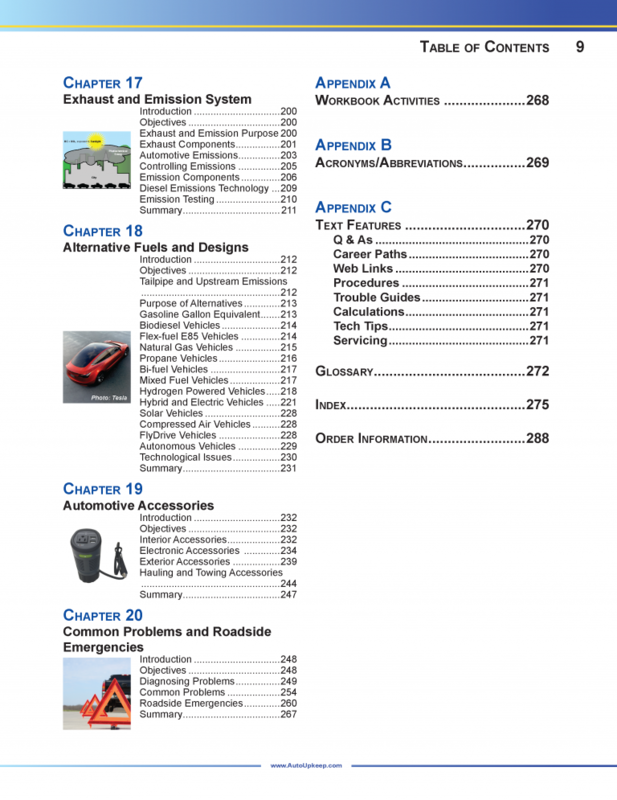 Automotive Expenses Activity – Calculate automotive expenses. 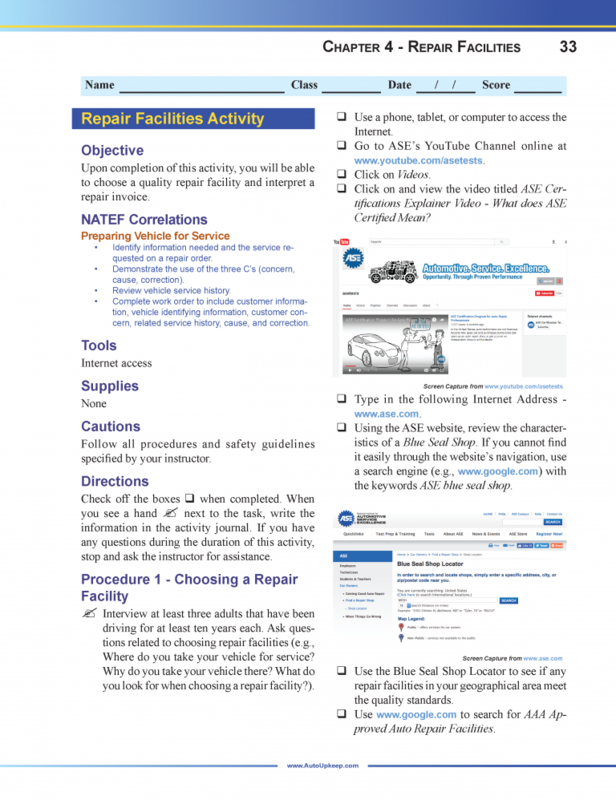 Repair Facilities Activity – Choose a quality repair facility. 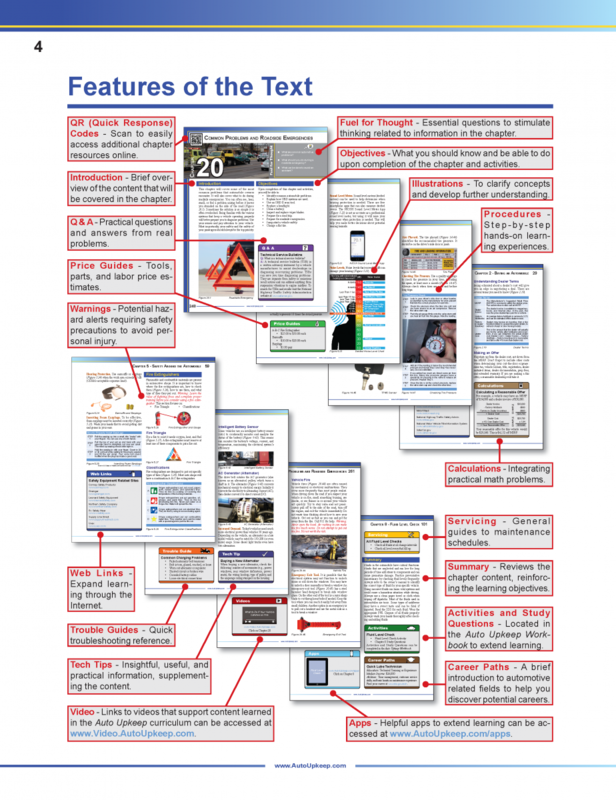 Interpret a repair invoice. 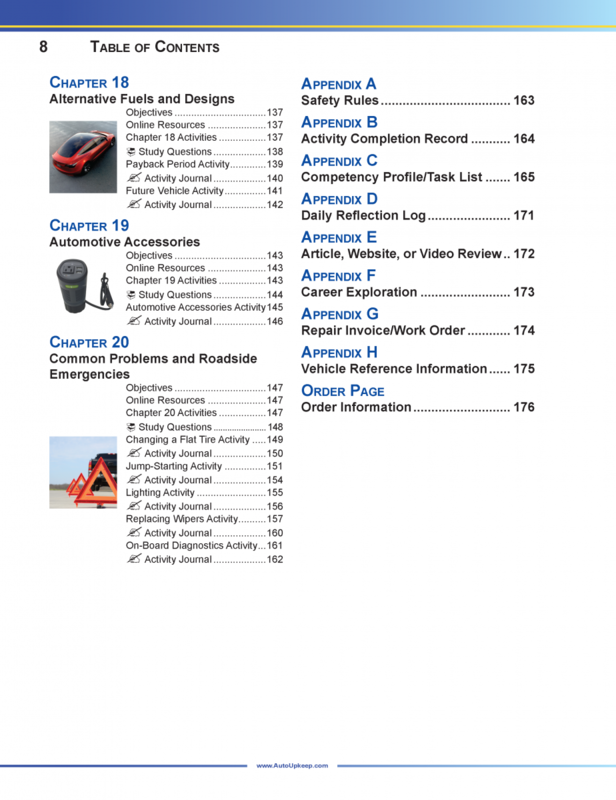 Automotive Safety Activity – Identify the location of emergency and safety equipment. Safety Data Sheets – Locate and interpret a safety data sheet. 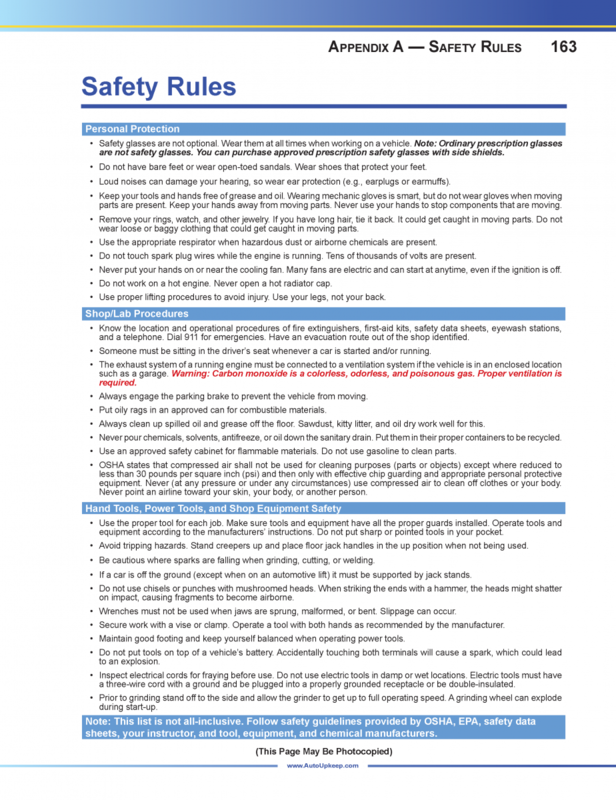 Personal Protection Equipment (PPE) and Fire Safety Activity – Identify the importance of using personal protection equipment and research fire safety. 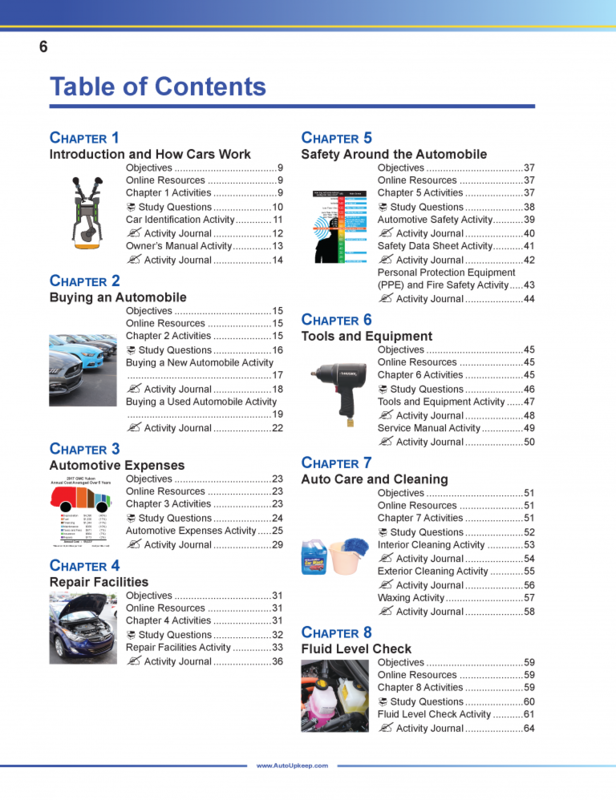 Tools and Equipment Activity – Identify basic tools and equipment that are used in automotive shops. 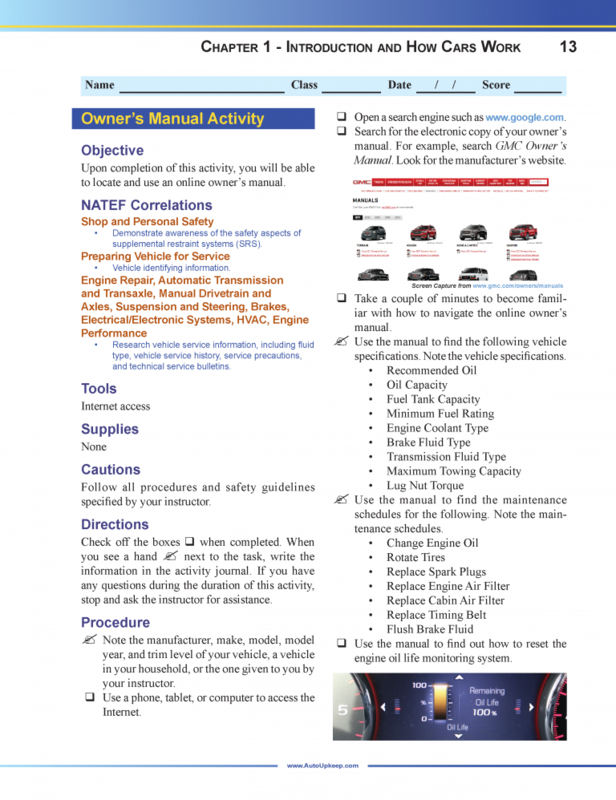 Service Manual Activity – Navigate an online service manual. 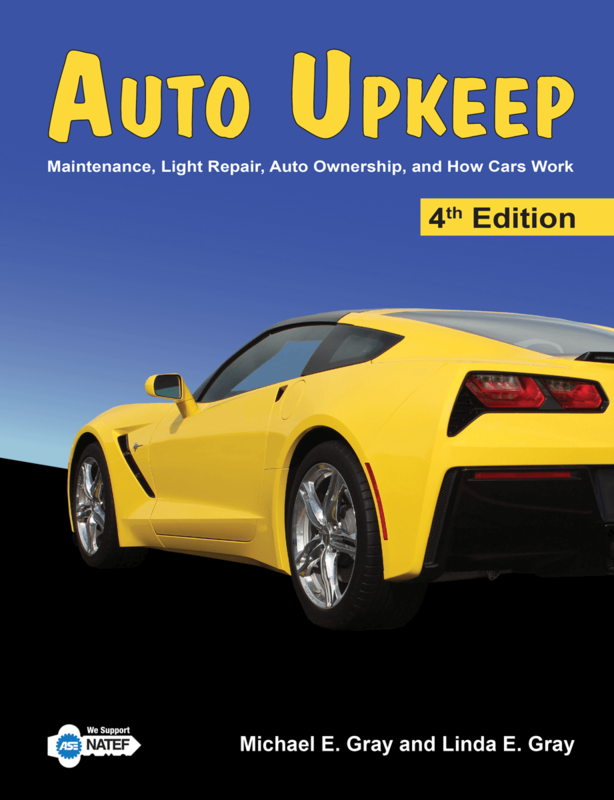 Interior Cleaning Activity – Clean the inside of a vehicle. Exterior Cleaning Activity – Clean the outside of a vehicle. 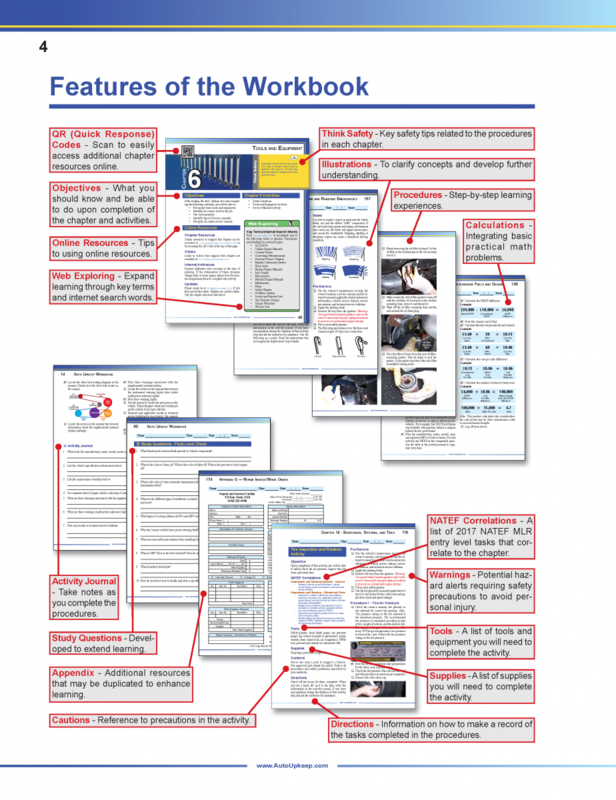 Waxing Activity – Wax the finish on a vehicle. 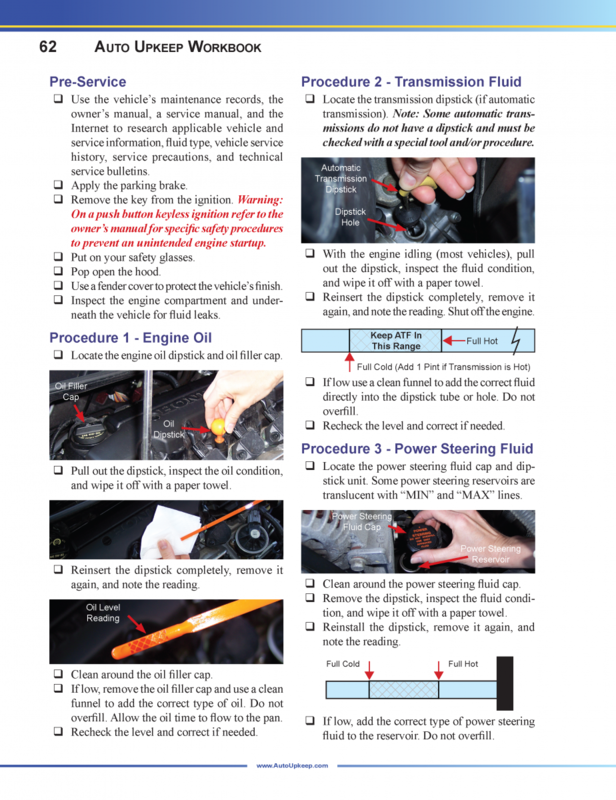 Fluid Level Check Activity – Safely check the fluid level in various vehicle components. 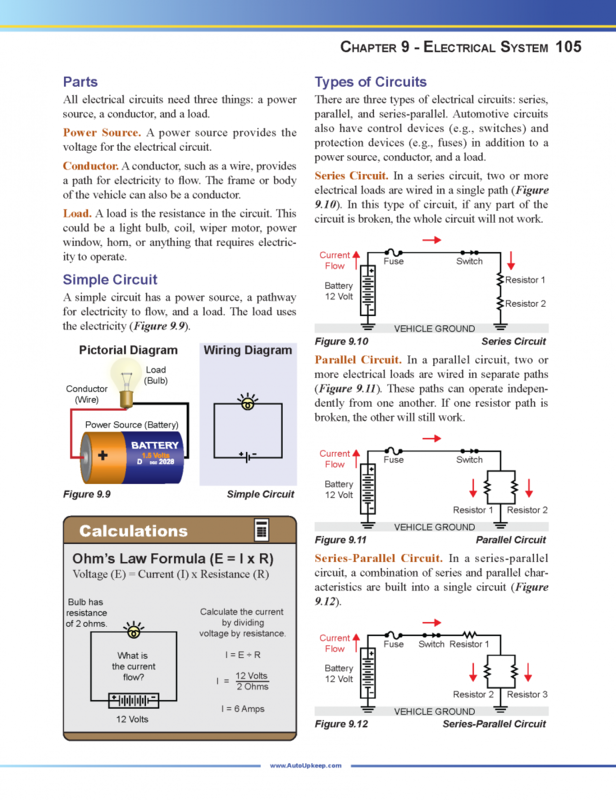 Ohms Law Activity – Use Ohms Law to calculate volts, amps, or ohms. 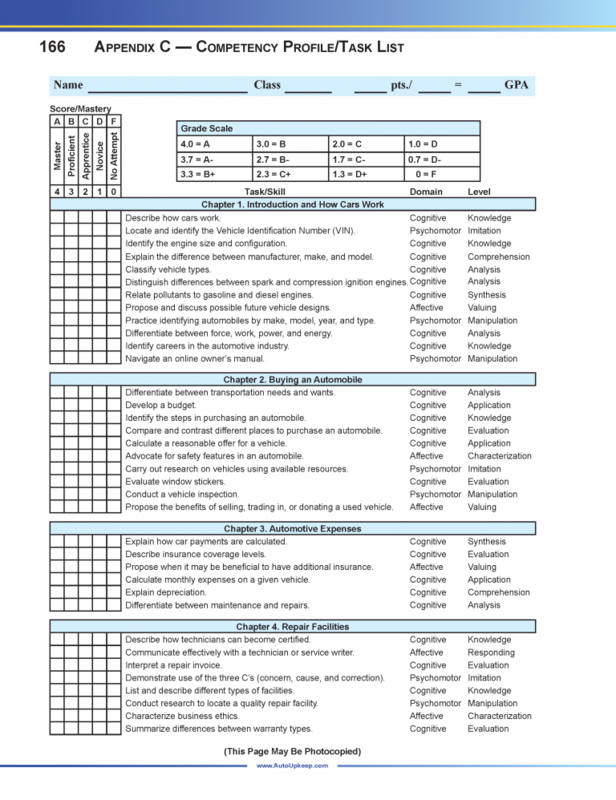 Wiring Diagram Activity – Locate and interpret a wiring diagram. 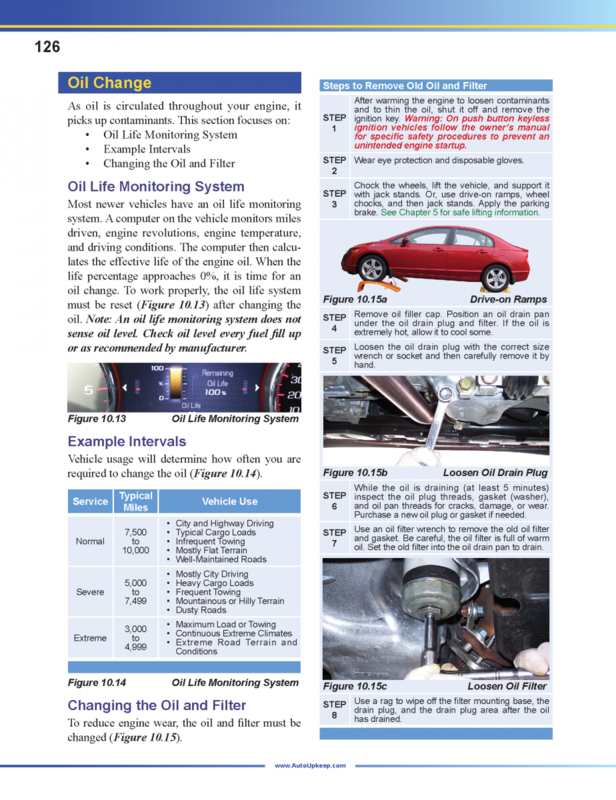 Battery Activity – Safely clean and test the battery. 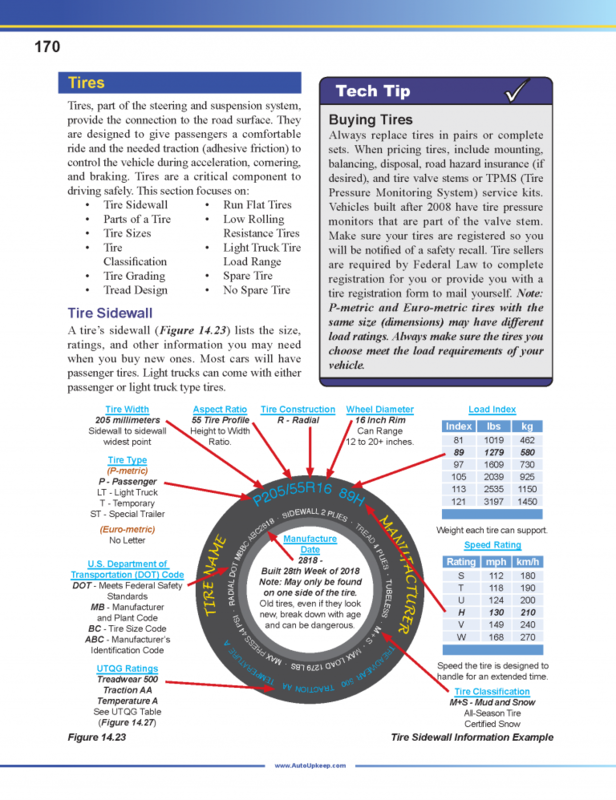 Charging Activity – Safely test the alternator. 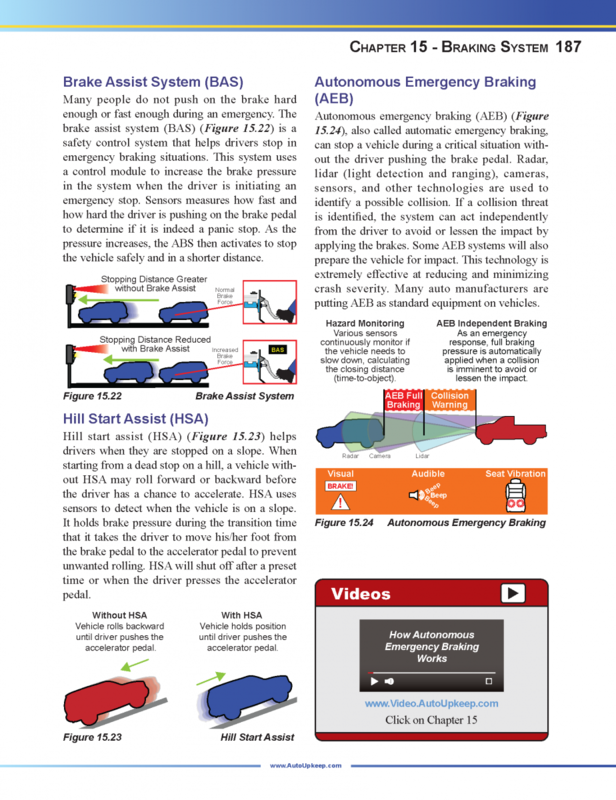 Starting Activity – Safely test the starter. 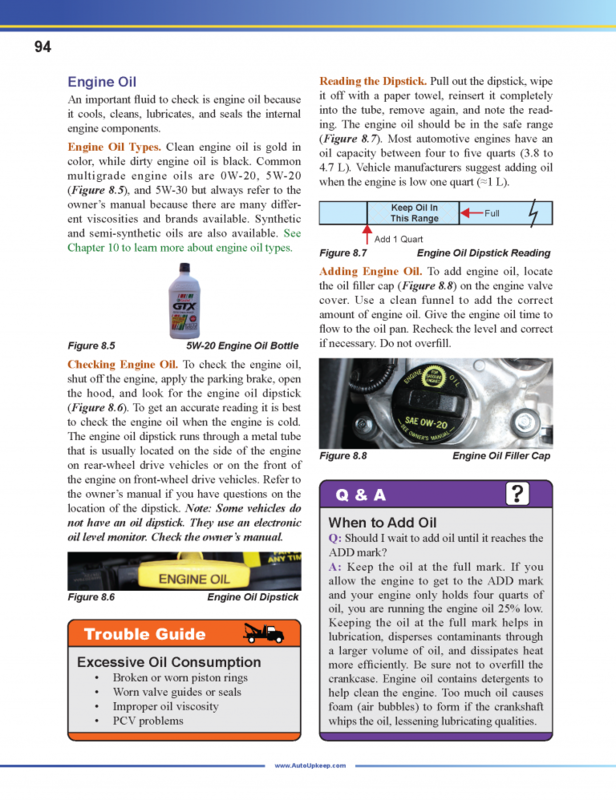 Oil and Filter Change Activity – Safely change the oil and filter on a vehicle. 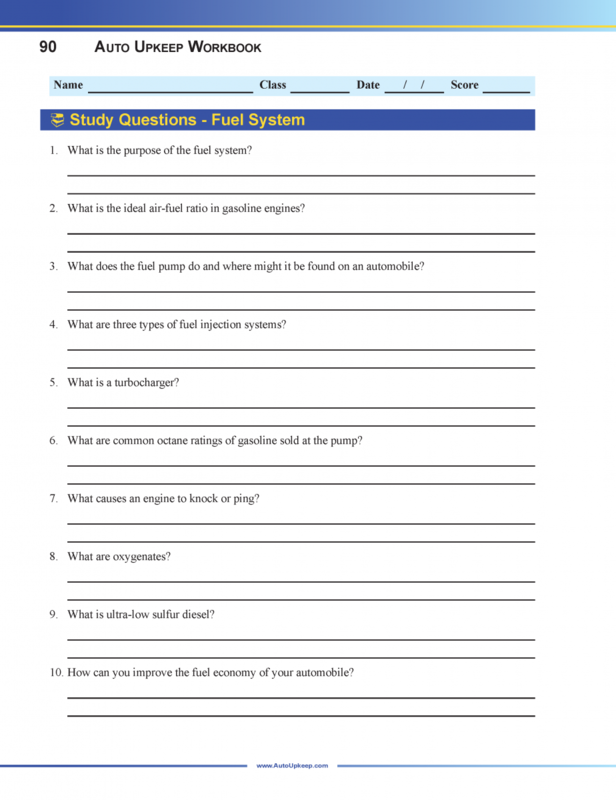 Fuel System Part Identification Activity – Use an online auto parts catalog to identify fuel system parts. Fuel System Maintenance Activity – Change the air filter, PCV valve, and fuel filter. 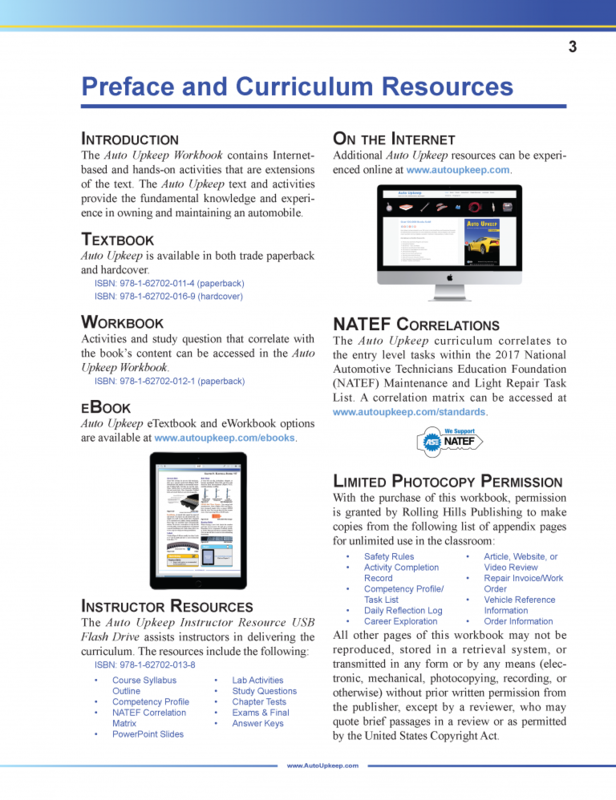 Air Conditioning Activity – Inspect and identify the components within the air conditioning system. 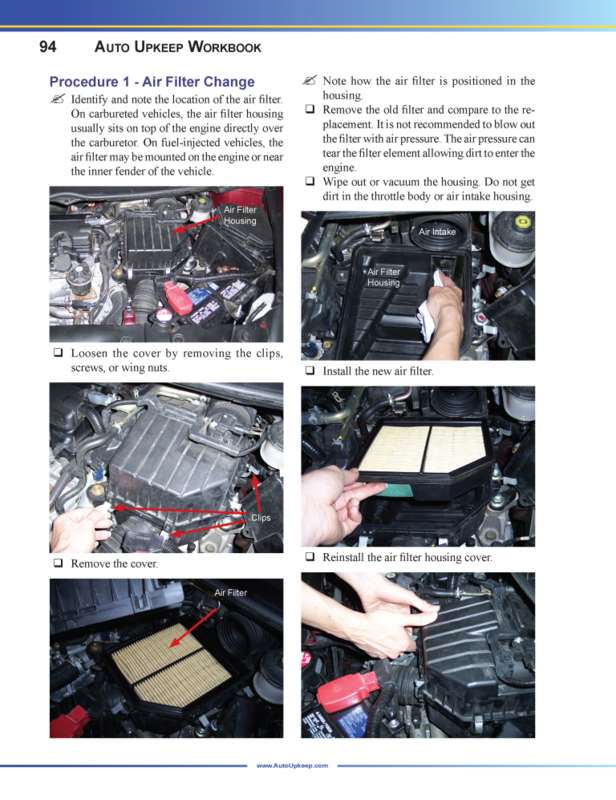 Cabin Air Filter Activity – Replace the cabin air filter on a vehicle. 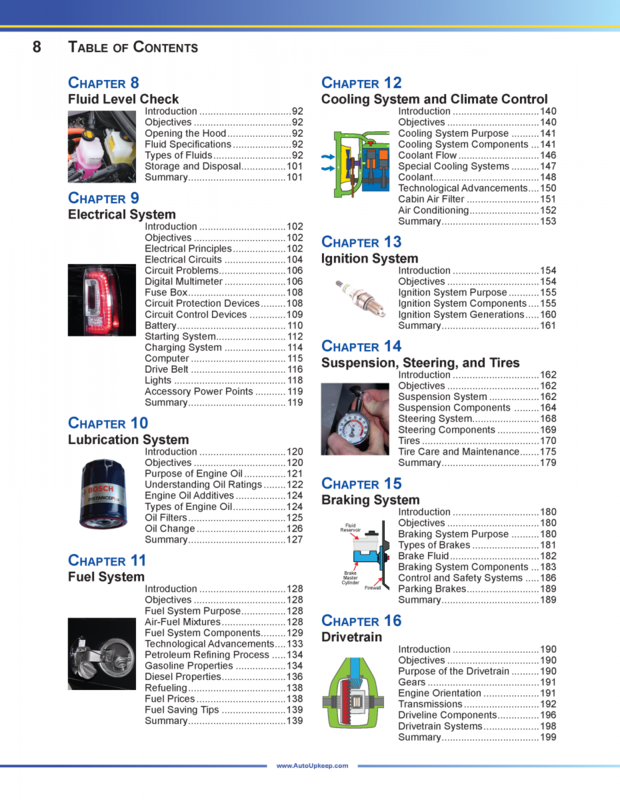 Cooling System Activity – Safely test, inspect, and service the cooling system. Observe thermostat operation. 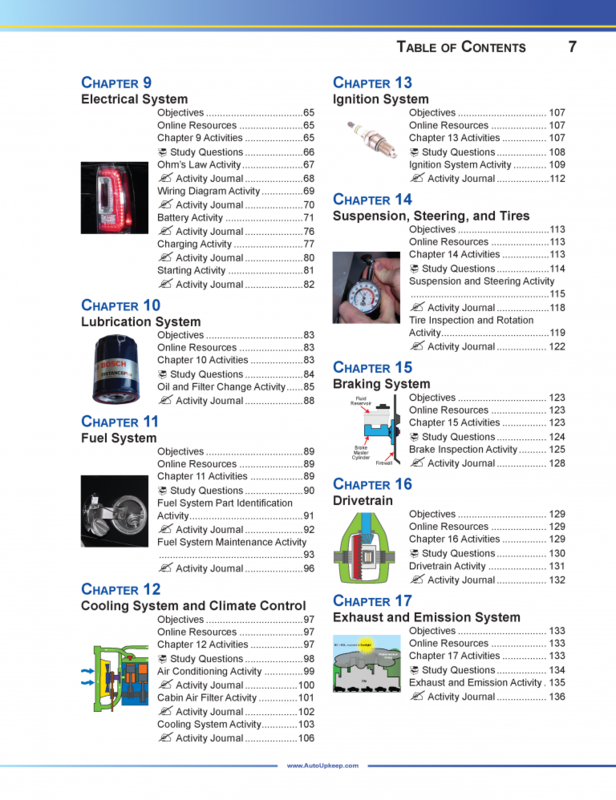 Ignition System Activity – Install spark plugs. 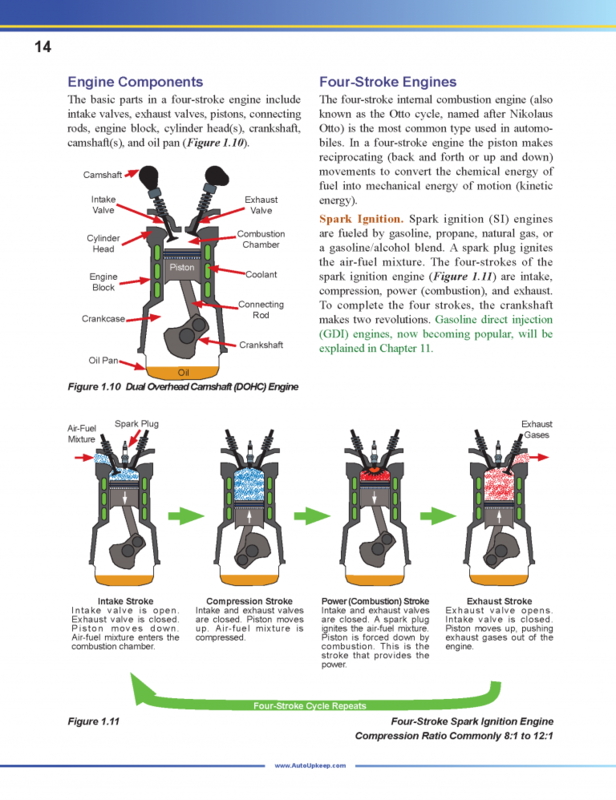 Inspect, test, and install spark plug wires. 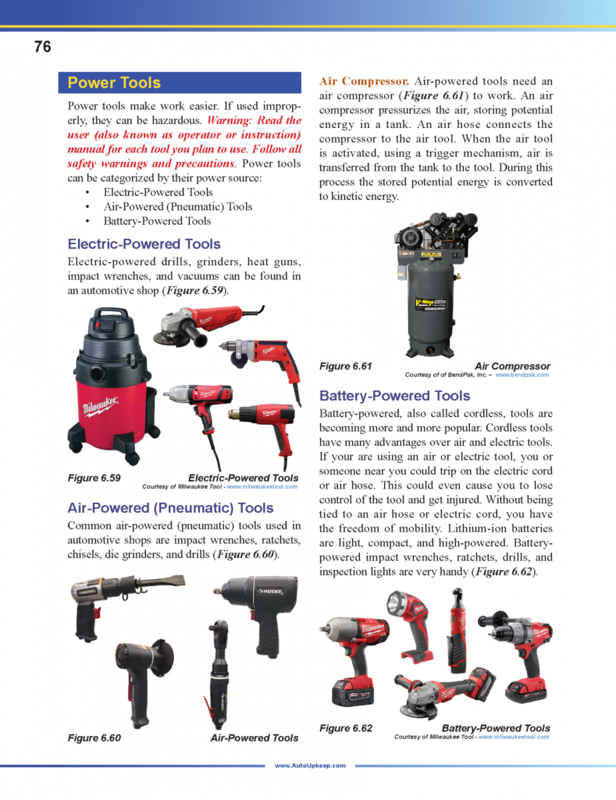 Inspect and install distributor cap and rotor on distributor systems. 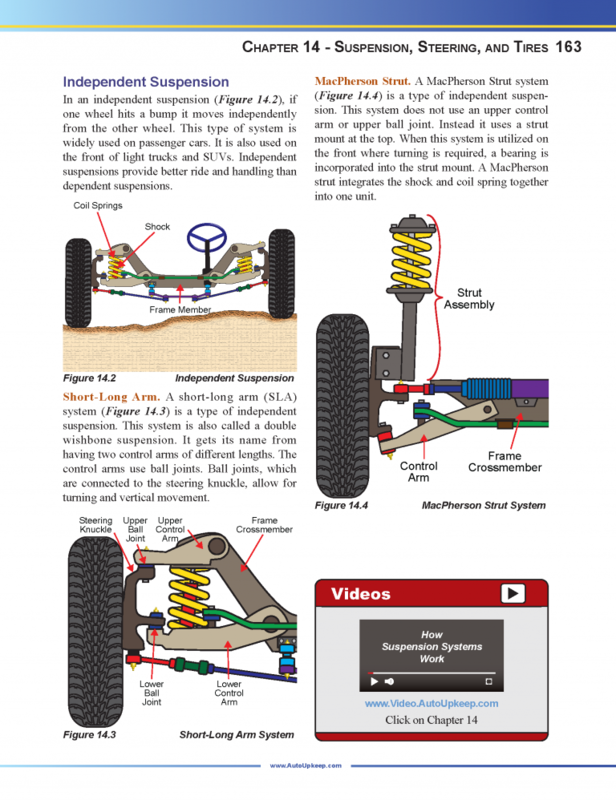 Suspension and Steering Activity – Safely inspect and perform basic service procedures on suspension and steering components. 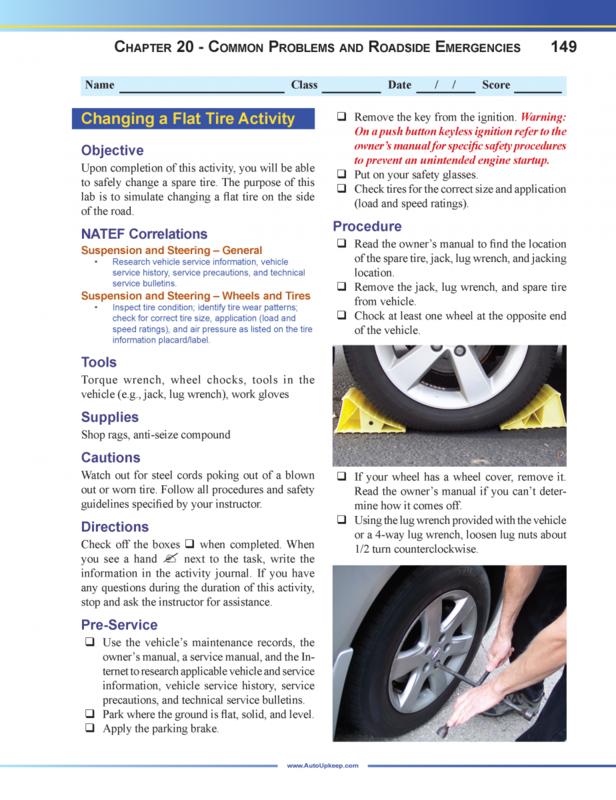 Tire Inspection and Rotation Activity – Safely inspect tires for wear and rotate tires. 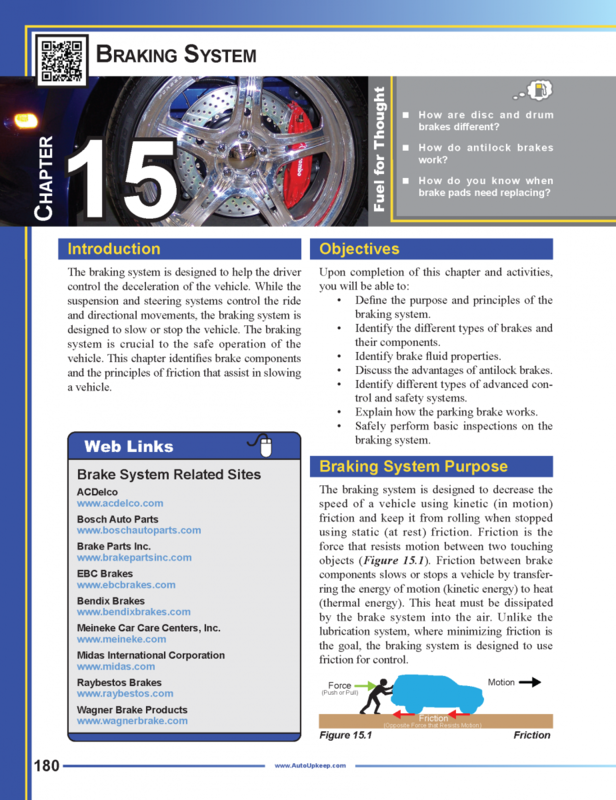 Brake Inspection Activity – Safely inspect disc brakes. 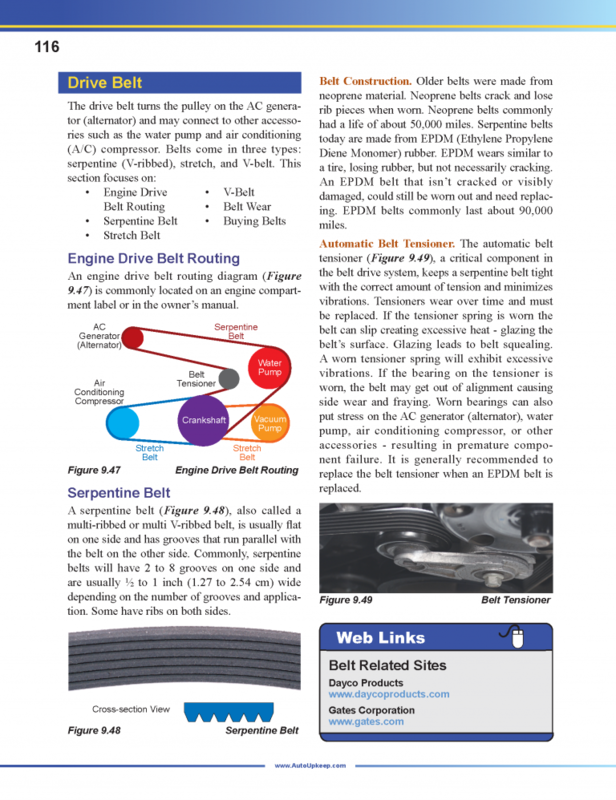 Drivetrain Activity – Safely inspect drivetrain components. 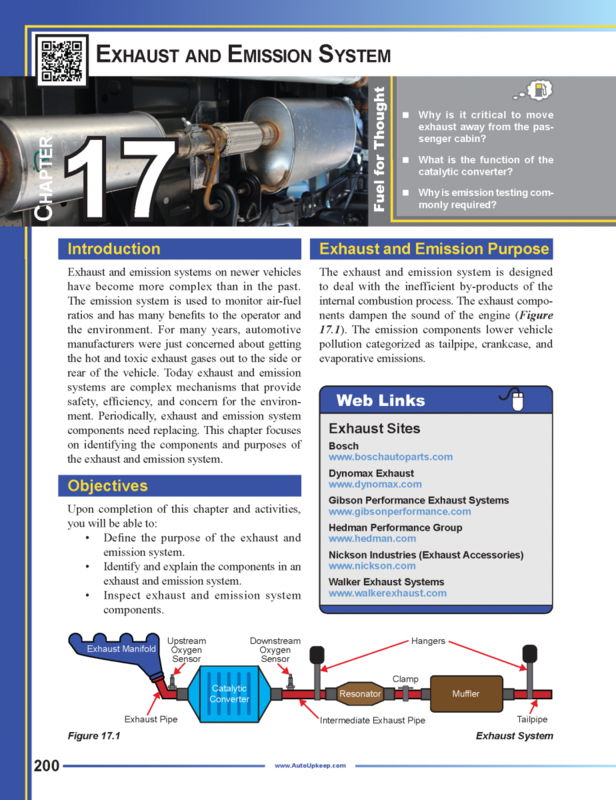 Exhaust and Emissions Activity – Safely inspect exhaust and emission components. 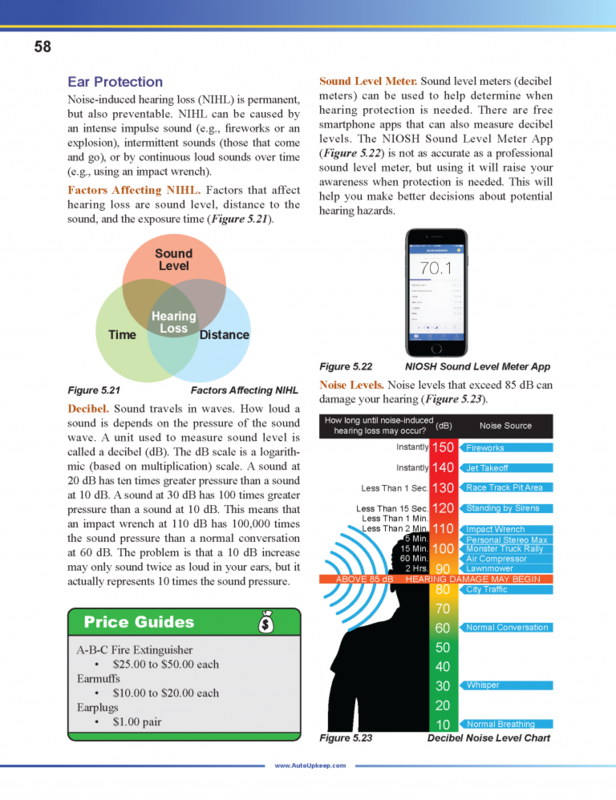 Payback Period Activity – Calculate payback period. 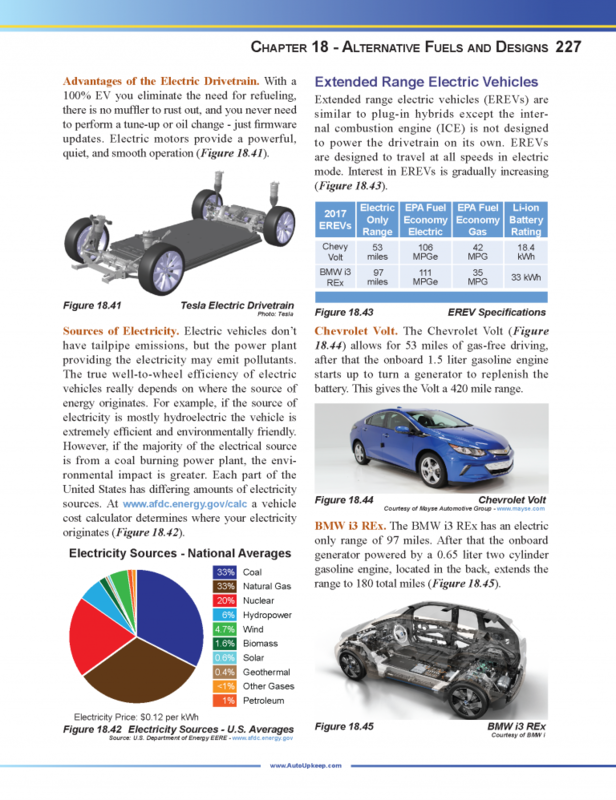 Future Vehicle Activity – Predict the role of automobiles in 2050. 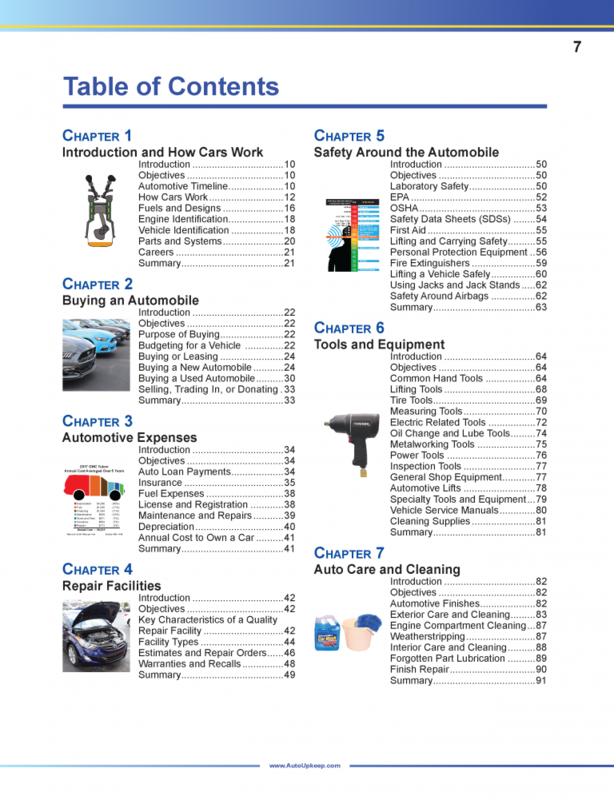 Automotive Accessories Activity – Estimate the cost of accessories for a vehicle. 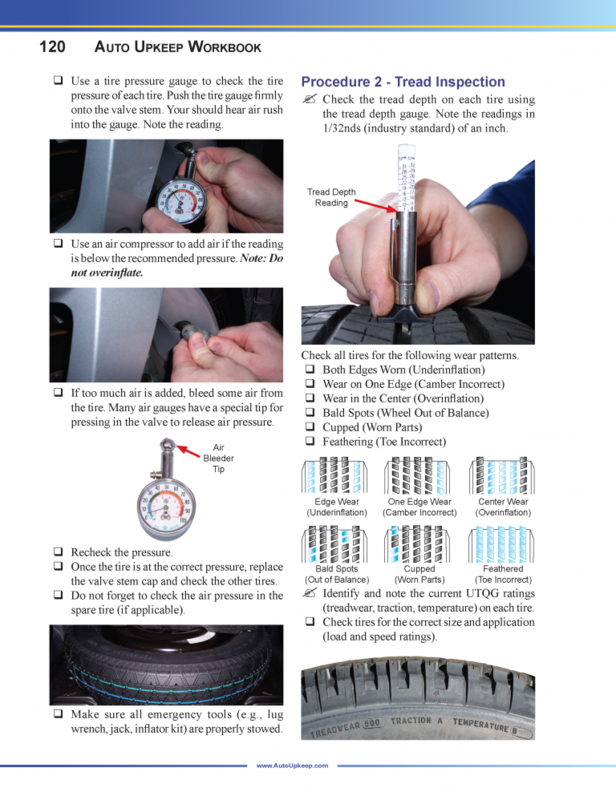 Changing a Flat Tire Activity – Safely change a spare tire. 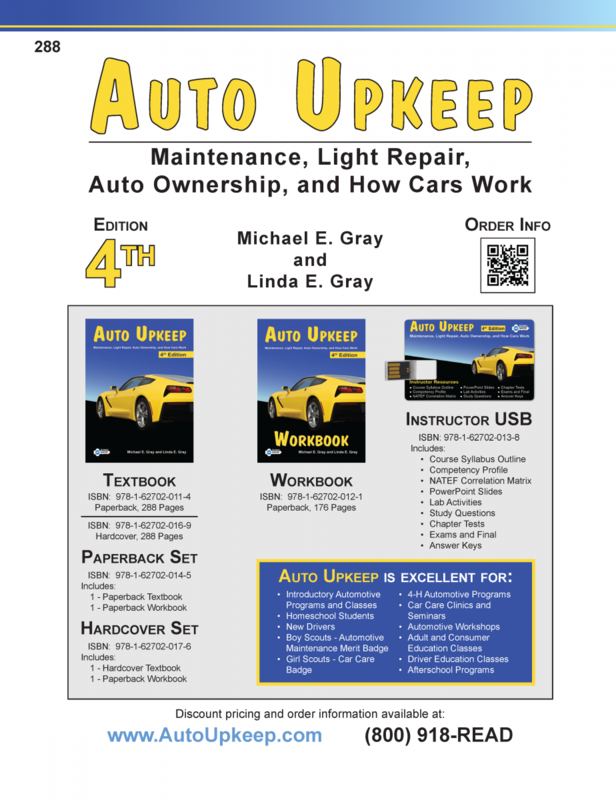 Jump-Starting Activity – Safely jump-start a vehicle. 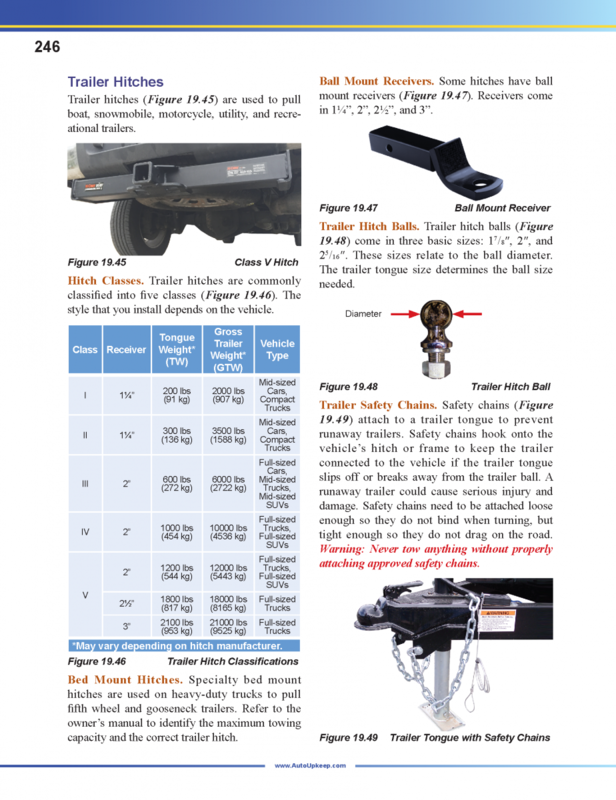 Lighting Activity – Replace various lights on a vehicle. 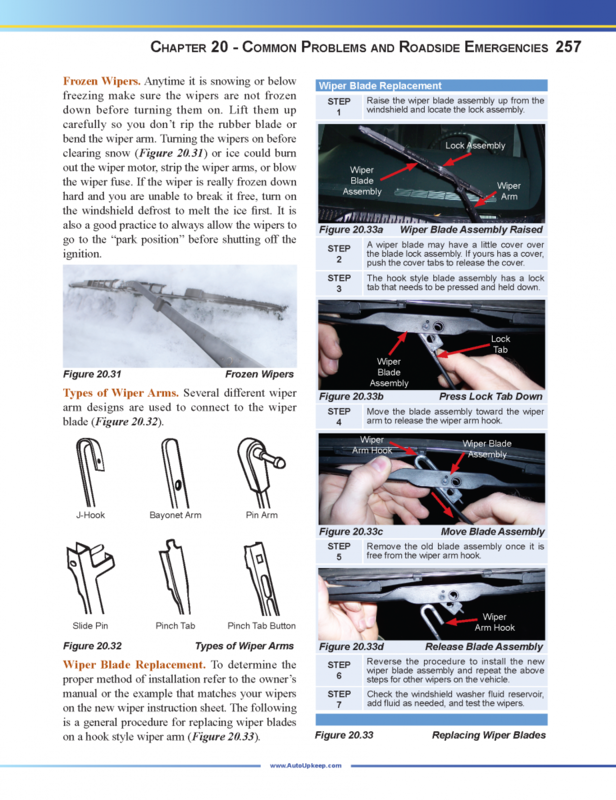 Replacing Wipers Activity – Replace wipers on a vehicle. On-Board Diagnostics Activity – Retrieve diagnostic trouble codes (DTCs) from an OBD II system.